Tuesday marks the fifth anniversary of when Robert Lewandowski returned home from a particularly successful day at work. Greeted by his wife Anna, along with 15 others who had come round for a late barbecue at the Lewandowskis’, a cry of “Bravo!” went up for the Polish striker as he came through the door. He had after all just scored all four of Borussia Dortmund’s goals in their 4-1 Champions League semi-final win against Real Madrid. For Anna, a karate champion herself, it was further proof that he was just “a normal guy”. “He showed the same reaction after four goals against Real Madrid as he would when his mother bakes him a cake,” as she put it in his autobiography. Normal doesn’t quite fit Lewandowski as a footballer off the pitch – whether it’s the fact that he famously has his dessert before his main course to try to burn fat quicker or that earlier this season he completed a bachelor’s degree in physical education in Warsaw. Nor does being normal fit what he did on that night in April. No player before in the Champions League era had even scored a hat-trick against Real, nor had any player ever scored four in a Champions League semi-final. That performance alone catapulted Lewandowski’s status to being one of the world’s best number nines, a status that he would cement after moving to rivals Bayern Munich on a free transfer just over a year later in 2014. Yet going into another Champions League semi-final against Real Madrid, there has been increased speculation around Lewandowski’s future, with a move even mooted to his opponents. This February, Lewandowski broke off on good terms with Cezary Kucharski, the Polish agent that plucked him from obscurity in the third division of Polish football. Taking over from Kucharski was Pini Zahavi, a super-agent responsible for brokering numerous key deals, most recently Neymar’s £200m world-record move to Paris St-Germain last summer. Zahavi’s co-operation with Lewandowski will last until 31 August 2018 – the final day of the summer transfer window in each of Europe’s big five leagues apart from the Premier League. That has led to increased speculation in Germany of a possible move and that Lewandowski was critical of the club’s transfer policy in September helped stoke that fire. “Bayern will have to come up with something and be creative if the club wants to keep bringing world-class players to Munich,” said Lewandowski to German news magazine Der Spiegel. Bayern had not consented to the interview. In the past few weeks, Rummenigge has reiterated too that Lewandowski is “100% staying this summer” which is likely. As the richest club in Germany, Bayern are under no financial pressure to sell while Lewandowski’s contract runs until 2021, with no exit clause. When Bayern Munich don’t want to sell, they don’t. But unlike Thomas Muller for instance, when Manchester United came after him, Lewandowski doesn’t have that same connection to Bayern which has helped to them to keep homegrown superstars. While they have a vice-like grip on the Bundesliga title, Bayern haven’t reached a Champions League final since beating Dortmund and Lewandowski in 2013. Real meanwhile have won the trophy in three of the past four seasons. Perhaps Lewandowski and Bayern advancing to the final could help convince Poland’s record international goalscorer that Munich is the right place for him. Lewandowski, though, knows that he’s admired in the Spanish capital, going back to that semi-final in 2013. Dortmund lost the second leg 2-0 at the Bernabeu but after going through on aggregate, Real Madrid president Florentino Perez cornered Lewandowski in a small room next to the changing rooms. According to the Pole, the conversation only lasted five minutes with Perez joking about the game before telling the striker he wanted to have him in Madrid. Not that that conversation will cross Lewandowski’s mind on Wednesday evening. “I’ve been used to the situation that there’s speculation about me for 10 years,” he said in a September interview with German magazine 11Freunde. That sort of focus has drawn praise from Lewandowski’s previous employers, including Manchester City boss Pep Guardiola, who called him “the most professional player I’ve worked with” when he was at Bayern. That was probably best showcased though when he was with Jurgen Klopp at Borussia Dortmund. Midway through what was his final season at the club in 2013, his move to Bayern on a free transfer was announced. Yet Lewandowski’s levels did not drop on the pitch. So much so, he finished as the Bundesliga’s top scorer for the first time. Most poignantly, in his final home game for the club, Lewandowski received his own ovation from the fans. Lewandowski teared up then and no wonder. “Klopp made me the footballer I am,” as he put it in 2015. The Polish striker was signed from Lech Poznan in the Ekstraklasa in 2010 for just 4.25m euros (£3.55m) with Dortmund beating Blackburn Rovers and Sam Allardyce, among others, to his signature. 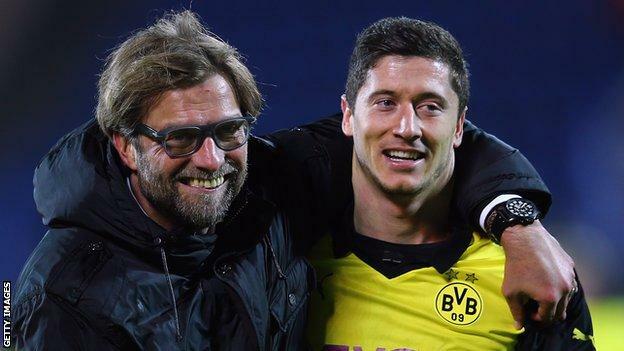 Together, they won the Bundesliga in their first season but it was in Lewandowski’s second season he became Klopp’s star striker. After an injury to Paraguayan Lucas Barrios, Lewandowski stepped in and never looked back. He went on to be the club’s top scorer in his remaining three seasons at Dortmund, winning another Bundesliga title and scoring twice in the German Cup final win over Bayern in 2012. His overall goal ratio of one every 111 minutes is the second best in Bundesliga history, behind only Bayern legend Gerd Muller on 105. When you take Lewandowski’s four seasons since moving to Bavaria, that ratio improves to one every 94 minutes. His most efficient performance off the bench saw Guardiola clasp his hands over his head in disbelief, as Lewandowski scored five in nine second-half minutes against Wolfsburg in 2015. Saturday wasn’t quite that impressive but the division’s top scorer came off the bench with just over 20 minutes to play on Saturday at Hannover,enough time for him to score his 28th of the league season. It’ll be a surprise if he doesn’t break the 30-goal barrier for the third Bundesliga campaign running. 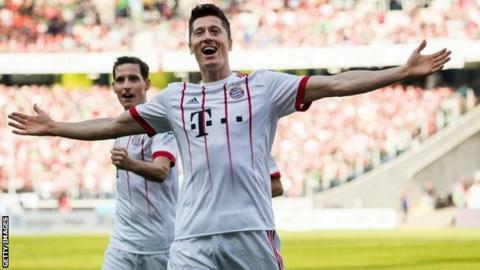 For the fourth season running, Lewandowski has been crowned as a German champion with Bayern too, the club’s sixth consecutive title. That was despite a poor start which saw Carlo Ancelotti shown the door, but even for long periods since Jupp Heynckes returned, Bayern were winning without performances matching the impressive results. In the last month that has changed with Bayern beginning to blow their opponents away, hitting four goals or more on six occasions. That didn’t include the Champions League quarter-final against Sevilla which, particularly in the first half of the away leg, was not an altogether smooth passage to the final four. It’s unlikely to be any easier for Bayern and Lewandowski against Real Madrid – a side that Bayern have lost to in each of their last four games. Lewandowski has missed two of a possible four games himself against Real since knocking them out with Dortmund in 2013. Last season, he missed Bayern’s quarter-final first-leg defeat by Real with a shoulder injury while he has also admitted that he wasn’t fully fit for the second leg, even if he scored. In 2014, meanwhile, he missed Dortmund’s 3-0 first-leg reverse at the same stage through suspension. This time, he’s fit and has the chance to make sure that his team aren’t playing catch-up come the second leg.